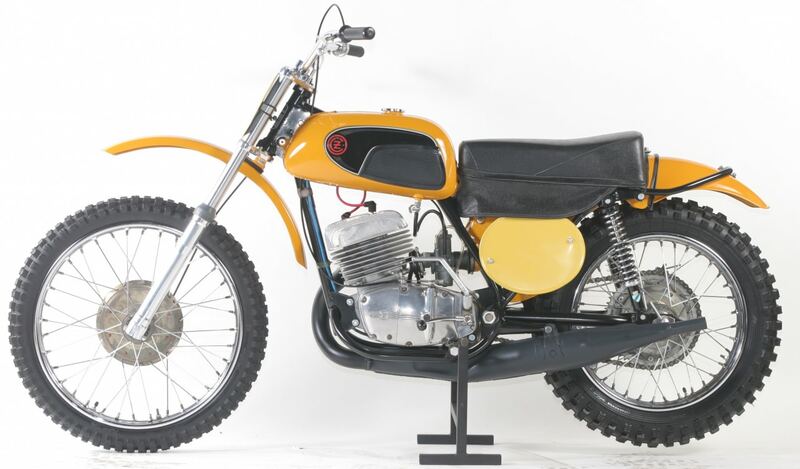 Manufactured in Czechoslovakia (the first CZ bike was made in 1932), the 1971-1972 yellow tankers were very similar to other CZ’s of the era. The commissars at the Ceske-Zavodny factory only made modest upgrades through the years, but most CZ’s can be told apart by their distinctive gas tanks. Red gas tanks were used in the late ’60s & 1970, the yellow tank in 1971-72, the steel coffin tank in 1973, and the flat-silver coffin tank in 1974. The 1972 CZ 400 was really a close relative of the 1970 and 1971 models and shared many of the traits and upgrades. The old CZ 360 was bored out to 380 and called the 400. Some of the most noticeable changes from the older versions were the two-piece fender and separate airbox, split downtube in front of the engine (instead of under it), bare shocks (without the chrome covers), and a longer steerer tube. Most notably, the gas tank was painted yellow with rubber knee pads. As with most CZ’s, the vast majority of parts were interchangeable with later models. 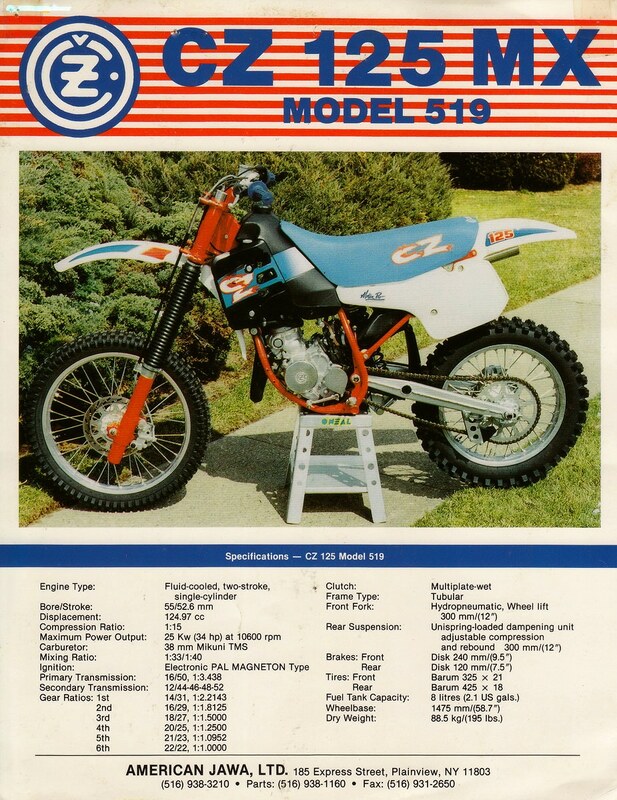 Competition from the Japanese factories made life difficult for CZ, as their best riders abandoned the Czech factory, most notably Roger DeCoster and Joel Robert, for the Japanese and Western European teams and CZ bike sales in the USA slumped. The last serious, but short-lived, racing effort came in 1982 with the Type 981 single-shocker. Also in the late ’80s, there was another failed attempt to return to the scene with the “Type 519” 125 and the “Type 520” 250, both equipped with new, liquid-cooled engines. 1989 CZ Model 519 brochure. Cagiva bought into CZ in 1991 to produce new CZ and Jawa street bikes for the Italian market. CZ even tried to build a 125cc street cruiser in the Czech Republic. This bike, called the Roadster 521, was a flop. The Cagiva partnership went belly up in 1997. CZ motorcycle production was terminated, and the factory began producing gearboxes for Skoda cars. New and never-ridden machines are considered the Holy Grail for collectors, but with CZ they are hard to find. 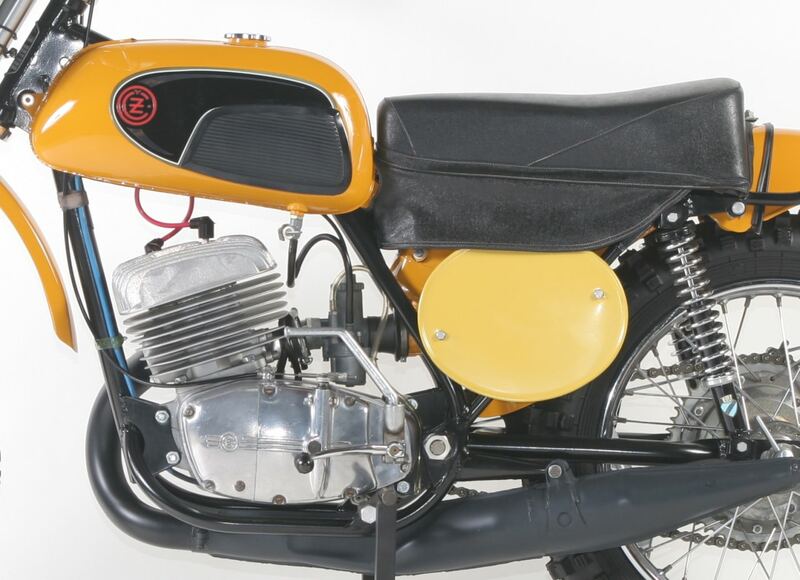 For the 1972 model, the most important part is the yellow gas tank, with checkerboard stripe and rubber knee pads. Sold new in 1972 for $1315, expect to pay $4000 for a restored version. Most of the new and never-ridden CZ’s have found homes with collectors. Look for an original machine with undamaged 1.8 gallon tank, Pal rear shocks, 32mm Jikov carb and the proper 981 or 981.1 engine.